A top North Wales green energy company has been named in the UK’s top three renewable heating installers at the industry’s annual national awards. Denbigh-based Hafod Renewables were presented with their award by Sir Lenny Henry at the Energy Efficiency Awards, the renewables industry ‘Oscars’ at the Hilton NEC Metropole Hotel in Birmingham. It was the latest accolade for the business, founded in 2010 by former Holywell High School pupil David Jones, 33, and which had been short-listed in three categories at the prestigious event. They were named with winners Ground Heat Installations, of Wigan, a major supplier to the social housing sector, and Northern Ireland’s Alternative Heat, which specialises in the UK commercial market, including hotels, schools, factories and food producers. 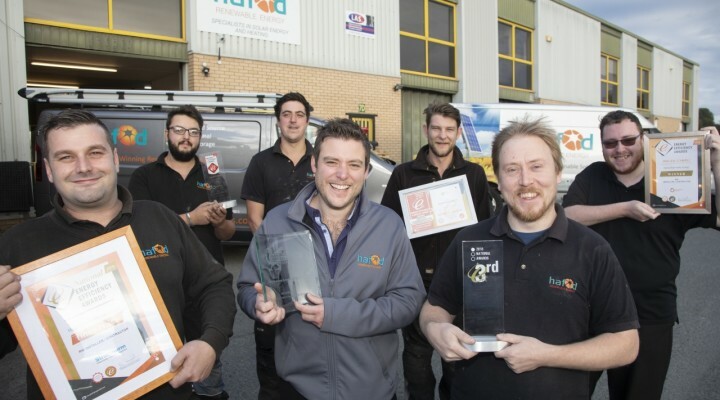 It follows their success as Renewable Heating Initiative Installer of the Year for Wales at Cardiff and David being named Young Business Leader of the Year in the Welsh Business Insider Awards in March. He said: “It was a tremendous thrill to come in the top three at the Energy Efficiency Awards in front of over 500 people from the industry from across the country. Hafod’s submission was based on a track record of installing over 100 RHI systems in 12 months including over 50 air source heat pumps including one provides underfloor heating to keep the abandoned dogs warm at the North Clwyd Animal Rescue charity’s kennels near Holywell. Over 40 ground-source heat systems include one at historic 16th century Caerfallen, near Ruthin, where four feet below the grass where sheep graze 600 metres of pipe tap into heat generated by the summer sun and stored in the ground to provide underfloor heating for a barn conversion. They have also provided twin biomass boilers to heat the 100,000 square feet of a Jewsons builders’ merchants in Langefni and and a solar thermal system at Sodom Hall, near Bodfari, where the roof panels heat water used by Norweft in their business of spinning the fine wool from their herd of 50 alpacas. Hafod Renewables now occupies a 125 square metre industrial unit on the Denbigh’s Colomendy Industrial Estate, employs nine staff and has become a key player in North Wales in the installation of solar and non-solar systems such as air and ground-source heating and biomass. Since they began in July 2010 they have fitted over 300 bespoke renewable heating systems and last year this sector grew to overtake solar power so that RHI now makes up 60 per cent of the £1 million turnover business. In those eight years they have fitted over 10,000 solar panels, including at more than 100 farms including Kilford Farm, near Denbigh, where 370 dairy cows produce 4,500 litres from each milking which has to be cooled and stored 3 to 5 degrees C in a giant tank to await collection and after each milking session the 300 feet of pipes have to be sluiced clean with a tankful of water heated, by electricity, to 85C. Gary Braybrooke, Chief Executive of the Energy Efficiency Association, said: “Hafod are a small firm competing against some very big names and the key to their continued success is their attention to detail, their professionalism and their customer care, they really look after the client. Hafod Renewable Energy Ltd installs a range of bespoke renewable heating systems from solar thermal to biomass as well as air and ground source heating and is an approved partner to two of the ‘green revolution’s’ biggest names, Tesla and Daikin.